A lot of people were scratching their head wondering how they could incorporate purple into this years wedding trends and it was no different for us. We set out to find a way to create a booth that used Ultra Violet in a way that we would love and instead it lead us to our newest collection of backdrops, The Velvet Collection. In the photobooth world velvet is what the OG booths rocked (the kind you saw at the mall and usually had wood paneling around it) but it was more of a dark red velvet that never complimented anyone. As the years went on, the backdrops started to evolve and velvet was a distant memory in photobooth history. Well, we are bringing back the velvet backdrop! Here are our first two looks that are available in our inventory now with more colours to come. All the brainstorming on how to incorporate ultra violet brought us here to a jewel toned booth. Rich blue velvet backdrop paired with a vintage ultra violet rug, gold accents, greenery and lots of fun geometric balloons in various jewel tones. Ugh, why are balloons just so fun to play with. Don't you just want to jump right in the middle of all the balloons and start playing around? I know we did. We didn't want to stop at just the one set up after seeing how luxurious and gorgeous the blue velvet looked so we started to work with a green velvet too! For this look we brought in the geometric shapes in the form of these beautiful rose gold Skyline chairs from Party Time Rentals. We wanted to keep a very green monochrome look which we achieved with the cactus and green sequin table cloth. 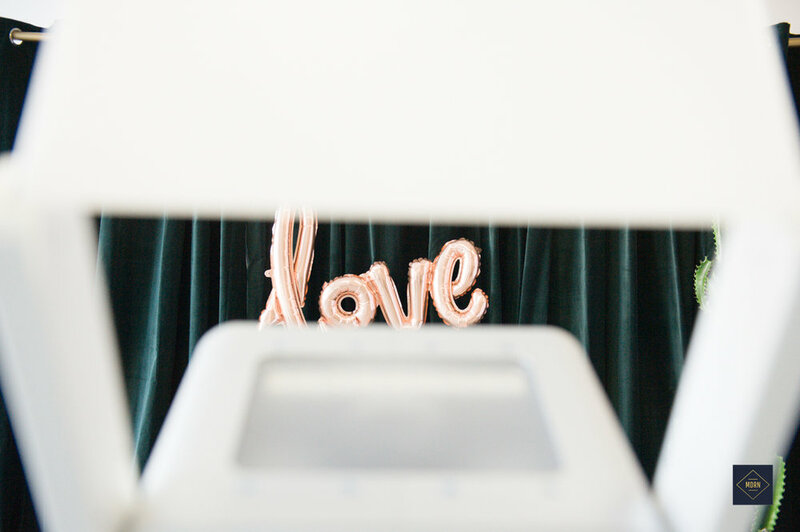 Seeing as how we were on a big balloon kick we had to throw in cute rose gold "love" balloon to top it all off.